This recipe is a sneak peak of a fantastic recipe from our upcoming Welcoming Kitchen book due out next spring. This recipe is a great example of Welcoming Kitchen cooking ... Even when you are living with dietary restrictions, you can still enjoy delicious treats! In a food processor, combine rice cereal and sunflower seed butter. Blend together until cereal is completely broken down. until chocolate is half-way melted. Remove from heat and continue stirring until completely melted. Spread 1 1/2 teaspoons melted chocolate into each muffin paper. 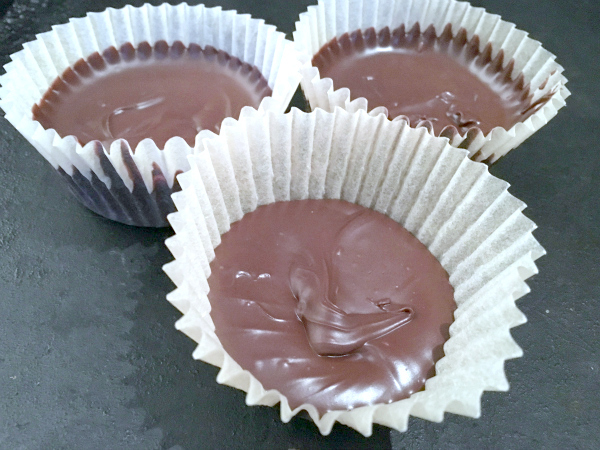 Top chocolate with 1 teaspoon sunflower seed butter mixture. Top each candy with 1 1/2 teaspoons melted chocolate. Keep candies in the refrigerator before serving, as the chocolate will begin to melt in a warmer room. How fab do these look? My son is allergic to nuts, egg, dairy, soya and potato and I just found your site. The recipes look great and very adaptable for my son. Welcome and keep coming back! We have lots of yummy (and safe) treats and meals that we're working on.